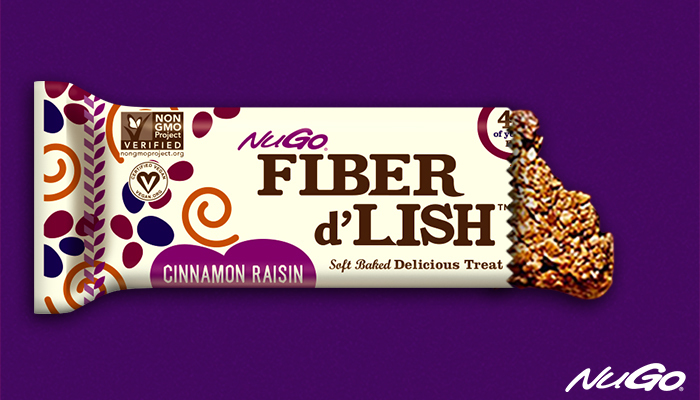 You have a choice when it comes to deciding which fiber bar to eat. But in terms of ingredient quality, health benefits and variety of taste, there is only one Best Fiber Bar. That bar is NuGo Fiber d’Lish. There are two types of fiber: soluble fiber and insoluble fiber. Soluble fiber dissolves in water, while insoluble fiber does not. Fruits and oats primarily contain soluble fiber. Whole grains and vegetables primarily provide insoluble fiber. “The soluble fiber forms the matrix on which the insoluble fiber sits. As a team they scrub the gut like a sponge and help to slow down the absorption of fats and sugar into the bloodstream,” said New York Hospital-Cornell attending physician Dr. Jacqueline Mayo. It’s well known that fiber is an important part of a healthy diet. Yet, few people know how intensely beneficial fiber can be. For example, did you know that a 2011 study published in the Archives of Internal Medicine determined that a high-fiber diet lowers overall risk of early death by 22%, and that the life-prolonging health benefits of fiber are most strongly associated with the fiber found in unprocessed whole grains, rather than in processed fiber. Fiber d’Lish bars use a blend of insoluble and soluble fiber that includes a proprietary mix of whole grains and seeds, and prebiotic inulin. Fiber d’Lish’s whole grains and seeds mix serves as the main ingredient in each bar, and is visible as soon as a Fiber d’Lish wrapper is unpeeled. No added sugar included. The ingredients in Fiber d’Lish bars are also Non-GMO Project Verified, kosher and soy-free. See all 8 Fiber d’Lish flavors here, or check out the Nutrition Information. This entry was posted in Fiber 101, Fiber d'Lish News, and Health Benefits of Fiber.